"What greater service can a musician do for music than to make it accessible and understandable to everyone?" Happy Holidays from Piano Discoveries! Mozart was born on a wintry day in January 1756 in the town of Salzburg, Austria. His father was Leopold Mozart and his mother was Anna Maria Pertl. 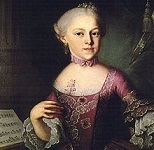 Leopold and Anna had seven children together, only two of whom survived infancy (the 4th child Maria Anna, also known as Nannerl, and the 7th child Wolfgang Amadeus). Mozart’s father, Leopold was a well known violinist, composer, and author (of a book on how to play the violin). Mozart learned his first piano piece at the age of five (Jan. 1761) and began performing in public only 9 months later (Sept. 1761). At the age of 13 Mozart became the Konzertmeister at the Court. Mozart spent many years traveling in Europe with his family, providing concerts and composing. 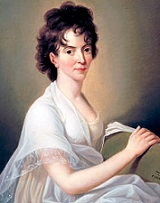 In June 1781 Mozart fell in love with Constanze Weber. They were married in the summer of 1782. Together they had 6 children, though most of them died in infancy. As a result, “there were endless doctor’s bills and endless funeral bills.” Additionally, “the couple moved twelve times in nine years. They fell deeper and deeper into debt.” Though Mozart’s adult life was filled with many personal trials it “never seemed to dam up the flood of music that poured from his happy-talking pen.” Mozart composed over 600 works in his lifetime, including operas; symphonies; concertos; various instrumental compositions; ballet; chamber music; piano sonatas, variations, minuets, fantasias, marches, and duets; organ works; masses; requiems; oratorios; cantatas; and vocal songs. Landon, H.C. Robbins. The Mozart Compendium: A Guide to Mozart’s Life and Music. Spain: Thames and Hudson, Ltd,London, 1990. Kidd, Leonice Thompson. They All Sat Down: Pianists in Profile. Florence,Kentucky: The Willis Music Company, 1986.